RIO DE JANEIRO – Recent investigation has found that Rio de Janeiro’s militia chiefs are now controlling their empires from prison. As reported recently by O Globo, many militia heads continue to coordinate their operations after incarceration, in the relative safety of seven square meter concrete cells. This form of leadership, pioneered by drug traffickers, appears to have been perfected by the militias. Ex-Military Police Ricardo Teixeira da Cruz aka Batman, in police custody, image recreation. One of the highest profile militia heads currently incarcerated, ex-Military Police Ricardo Teixeira da Cruz “Batman” is believed to be executing orders from his cell in the Federal Penitentiary in Campo Grande (Minas Gerais). The militia chief, thought to be head of the Liga da Justiça (League of Justice) militia faction, has supposedly passed notes and letters routinely during visits, usually finding their way to his closest cohort still in liberty, former Military Police Officer Toni Ângelo de Souza Aguiar. Elaborate systems of corruption and bribes assure that messages are passed without interruption, though communiqués are now being monitored by the Delegacia de Repressão a Ações Criminosas Organizadas (Department of Repression against Organized Crime, Draco) and the Grupo de Atuação Especial de Combate ao Crime Organizado (Group of Special Action in Combat of Organized Crime, Gaeco). As of now however, the lines of communication appear to remain open. In the early morning of Wednesday April 13th, approximately 80 police officers took part in an operation in Jacarépagua that ended in the arrest of city councilman Luiz André Ferreira da Silva. Known as “Deco,” the target of the operation is suspected of leading an illegal militia that controls at least seven communities in the Zona Oeste (West zone), including the areas of Praça Seca, Campinho, Tanque, and Quintinho to the north of Cidade de Deus (City of God). 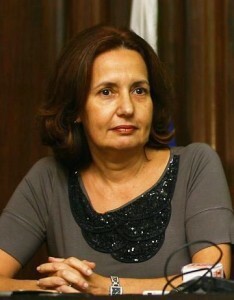 New Civil Police Chief Martha Rocha was the target of an alleged assassination plot, photo by Divulgação. 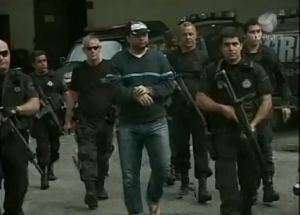 Deco’s group is believed to have been planning the assassination of State Deputy Marcelo Freixo, president of the CPI das Milícias da Assembleia Legislativa (Legislative Assembly’s Commission of Parliamentary Inquiry of Militias), another councilman, and current Civil Police Chief, Martha Rocha. The arrest of the councilman Luiz André Ferreira da Silva is a reminder of the scope of influence exercised by the militias. He is not the first politician to be arrested for participation in these illegal organizations. In 2008, former State Deputy Natalino Guimarães was arrested and accused of controlling a militia in Campo Grande (West Zone), and over the years a handful of other city councilmen have been arrested and accused of similar criminal associations. Many feel that the militias (made up of current and ex-policemen and firemen) have an advantage over their drug trafficking competitors due to already present political inroads and influence. Though in existence since the 1970s, militias took center stage about five years ago. Many have taken over territory under the guise of rescuing communities plagued with drug trafficking, however the militia alternative is often far worse. Militias routinely charge local residents mafia-like “taxes” for water, electricity, and protection. Some groups enforce a 20 percent tax on local property sales, and others have even been accused of trafficking drugs themselves. Militias are more difficult for the state to combat, principally because of their deep integration into the police force and some political spheres. If the drug trafficking factions of Rio de Janeiro are ugly surface wounds, the militias are unfortunate signs of internal bleeding.